An elegant 1940s necklace and bracelet set created from sparkling faceted black glass. The large oval pieces of faceted glass are prong set in open back settings. Really a remarkably beautiful set that was worn gently and well cared for. Not hallmarked. Item #10897 Price: $145 USD Tell me more! Faceted mirrorlike hematite stones surrounded by delicate silver filigree. A beautiful necklace, bracelet and earrings set by Danecraft. The link bracelet closes with a fold over clasp. The necklace features a snake chain of silver and closes with a hook clasp. The earrings are clip. Extremely Fine condition with no damage or repairs to the metal. All of the stones are in pristine condition with no scratches or chips. Lightly tarnished. All pieces are hallmarked, Danecraft Sterling. Item #10760 Price: $175 USD Tell me more! 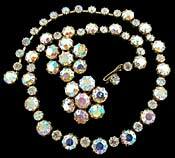 A simply beautiful vintage aurora borealis necklace and earrings set by Weiss. Each piece is hallmarked. Extremely Fine condition. Item # 10652 Price: $125 USD Tell me more! All the magic of the aurora borealis predominately in hues of rose. There are sparkles and flashes in golds, greens and blues as well. 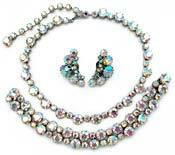 A delightful set that includes a necklace, bracelet and earrings. Extremely Fine condition. Not hallmarked. Item # 10527 Price: $125 USD Tell me more! Fanciful swirls of sterling silver!! A beautiful vintage Danecraft sterling silver set that is somewhat similar in design to the sea shell, the chambered nautilus. Or perhaps the swirls are small waves. Depending on how you turn the necklace and bracelet, the swirls can be swirling up or swirling down. Item # 10419 Price: SOLD $175 USD Tell me more! A unique bracelet and necklace created from brass that has been inlaid with ivory and ochre enamel. Between the enamel pieces are large ochre satin glass cabochons that have been bezel set in brass. The brass settings are very ornate and also inlaid with ochre enamel. Extremely Fine condition. Item # 10600 Price: $325 USD Tell me more! A complete set of vintage gold filled 1950s scarab jewelry. Needless to say, this is a rare find. All scarabs are carved from semi-precious stones and each piece in this set is hallmarked. 12k Gold Filled. Amco. Extremely Fine condition. Item # 10537 Price: SOLD $275 USD Tell me more! Sparkling rhinestone jewelry by Bogoff. 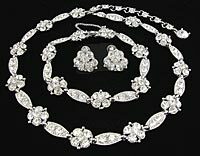 A beautiful vintage necklace, bracelet, and earrings set created from rhodium plated metal set with clear rhinestones. Extremely Fine condition with no damage or repairs. Every rhinestone is bright with no dark or dull stones. No missing or replaced stones. Each piece is hallmarked, Bogoff. Item #10793 Price: SOLD $125 USD Tell me more! Beautiful sparkling rhinestones in settings that are uniquely Bogoff. The metal has been rhodium plated which add additional bright sparkle to this set. Extremely Fine condition. All pieces hallmarked. Item # 10645 Price: SOLD $145 USD Tell me more! Magical Aurora Borealis! 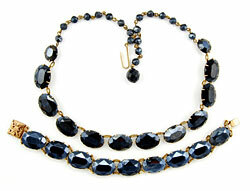 An exquisite necklace, bracelet and earrings set by Weiss. All pieces are marked and all pieces match perfectly. Comprised of silver toned metal and rhinestones that sparkle and glow in all of the glorious shades of the Northern Lights. Item #10461 Price: SOLD $265 USD Tell me more!